Did the Fed accidentally help Trump win in 2016? © Illustrated | jjgervasi/iStock, Spencer Platt/Getty Images, Tatomm_iStock President Trump. Did the Federal Reserve inadvertently help President Trump win in 2016? There's a huge array of factors that go into determining why Americans pick the presidents they do. But research suggests the economy may be as much as half the mix. And it generally looks like the trend in the year running up to the election is overwhelmingly important: an improving economy favors the incumbent party; a falling one favors the opposition. Well, it turns out the central bank's decision to finally start raising interest rates in late 2015 likely hit American sectors like energy, agriculture, and manufacturing hard. The result was a "mini-recession," as Neil Irwin termed it in TheNew York Times. "Severe in certain places, but concentrated enough that it did not throw the overall United States economy into contraction." That mini-recession dragged down key industries in rural areas that ultimately swung for Trump, just in time the for the 2016 election. As Irwin tells it, things played out like this: The Fed finally decided in December 2015 to hike interest rates, with a plan to keep raising them gradually. Interest rates had been at rock bottom ever since the 2008 crash, and the idea was that the national economy was finally strong enough for the central bank to begin normalizing. But other central banks, like those in Japan and the European Union, were lowering interest rates, leading to a big run-up in the value of the U.S. dollar versus other currencies. This caused myriad problems around the world. It made debts that emerging markets had taken out in U.S. dollars harder to pay back. (Turkey, for example, is still struggling with this.) China was trying to devalue its own currency to control an economic slowdown, but the Fed's decision caused them to overshoot the mark. The Chinese government didn't get the resulting capital flight under control until 2017. Since other emerging markets often supply China with physical goods to supply its massive growth, the country's slowdown hit their economies too. Oil prices had already fallen off a cliff in 2014, which just added to emerging markets' woes. All these factors crushed specific U.S. industries. Energy was wrecked by the oil price fall; agriculture and manufacturing — export reliant industries — suddenly lost a lot of international buyers, not to mention demand supplied by one another. According to the Times, agricultural machinery production dropped 38 percent from 2014 to 2016; petroleum and natural gas infrastructure fell 60 percent. Caterpillar alone saw revenue fall 30 percent. By September 2015, all seven regional manufacturing indexes had already been in decline for months and had just entered negative territory, indicating a contraction. News headlines at the end of the year openly wondered if the whole economy was headed for recession in 2016; indeed, overall U.S. economic growth briefly ground to a near-total halt in that period. National spending on structures and investment plunged from mid-2014 to the start of 2016. "Overall economic growth slowed but remained in positive territory," Irwin wrote. "The national unemployment rate kept falling. Anyone who didn't work in energy, agriculture, or manufacturing could be forgiven for not noticing it at all." But for manufacturing specifically, revised Fed data shows a drop that starts at the beginning of 2015, bottoms out in mid-2016, and doesn't really start recovering until 2017. Amusingly, this episode reinforces the point that the business investment boom the Trump White House wants to credit for 2017's economic growth was actually just a recovery to trend. Irwin also sees the mini-recession as an implicit critique of President Trump's protectionism and isolationism. "The episode is stark evidence of the risk the Trump administration faces in threatening economic damage to negotiate leverage with other nations on trade and security," he writes. "Like it or not, the complexity of our global connections means that policy can't just focus on the home front." Well, yes, to a degree. But I think the bigger takeaway is that when the U.S. Federal Reserve sets monetary policy, it's not just setting it for the American economy. It's setting it for the entire world. Overestimating the strength of the domestic economy and the threat of inflation, while underestimating how much recovery wages and jobs still need, has been a chronic problem at the Fed. Based on the institution's historical behavior, I'm sure most Fed officials think it moved with great caution in raising interest rates. Based on those considerations alone, it shouldn't have moved so soon or even at the modest pace it planned. Beyond that, it also looks like the Fed didn't really consider how much its eagerness for "normalized" rates could hurt the rest of the world — and then boomerang back to hit various parts of the American economy. Blessedly, cool heads at the central bank, like then-Fed Chair Janet Yellen, eventually realized what was happening. Which helps explain why a whole year lapsed between the December 2015 rate hike and the next increase. Still, the Federal Reserve could've saved millions of Americans and businesses some grief — not to mention millions of workers in other countries — if it had a less itchy trigger finger. And while it's impossible to say the Fed's actions definitely caused the mess in the White House, they certainly didn't help. 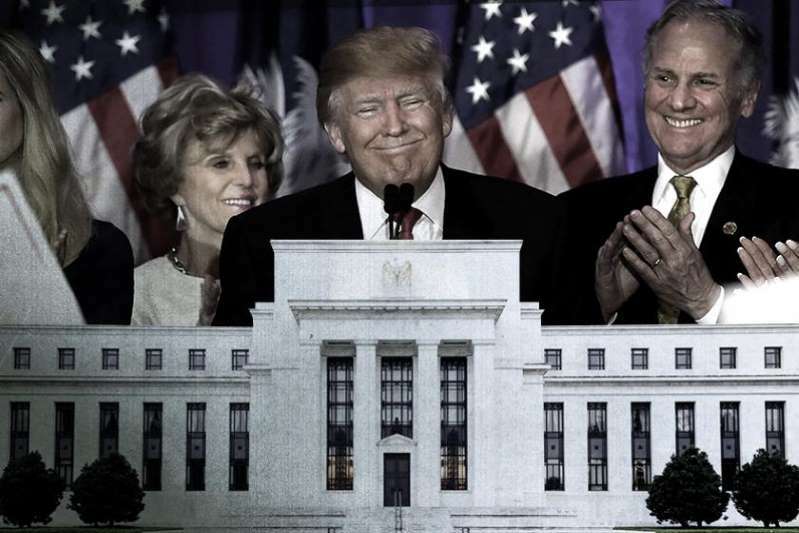 Politics - U.S. Daily News: Did the Fed accidentally help Trump win in 2016?